Over the last several years digital gaming has grown in popularity within the education field. Since gaming is something that most students do in their free time, utilizing it in different ways for learning can inspire and engage learners (EDUCAUSE 2018). In the last year, I have been working on developing a Minecraft server. 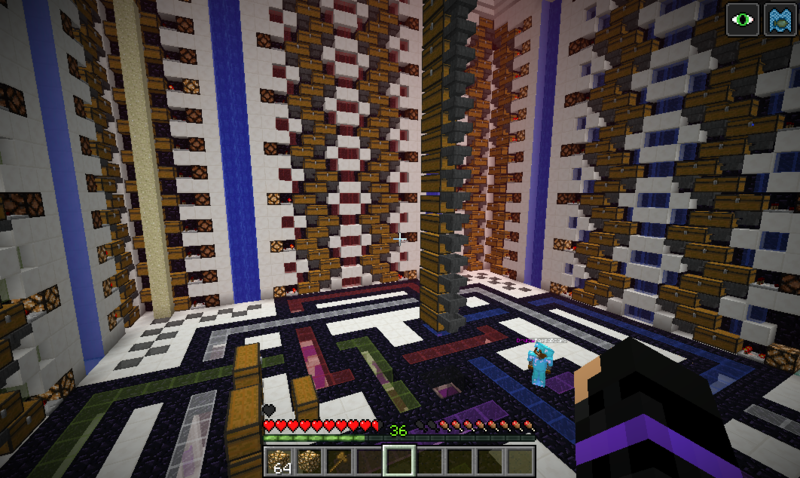 This server is a special game mode in the Minecraft world called factions. The game mode requires players to gather up a team to compete with other teams in order to have the highest monetary value. In order to increase their worth, they have to build farms and sell the items that are produced. Collaboration is a major key when factions are building bases to protect all of their assets. 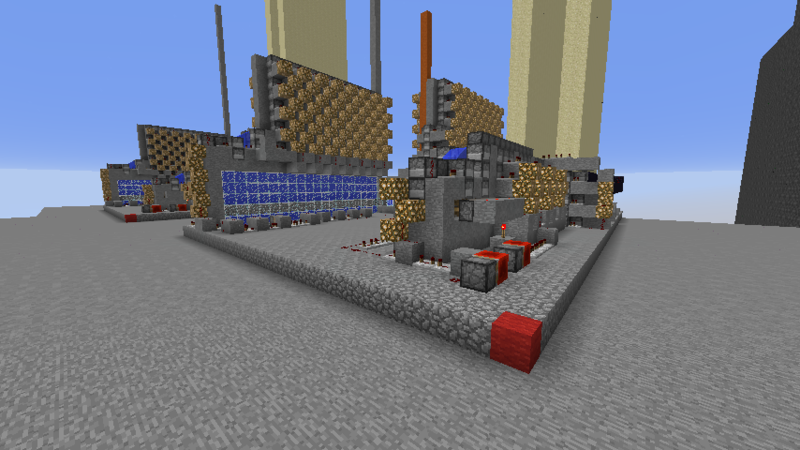 Factions that are enemies can cannon into your base using complex cannon design-builds created with Redstone circuitry. A lot of times these complex systems fail so players must come up quickly with problem-solving strategies to get it up and running again, below is one of the complex cannon model built by one of the players. Not only are there learning moments in the gameplay but also learning moments during the creation of the server. I have a team of people anywhere from ages 13-35 that help with creating content, customer service, communication and helping troubleshoot game breaking bugs. Below is a picture showing a complex Redstone system created by one of the players to sort items being dropped from one of their farms. Communication is another big skill that a lot of these staff need or are able to develop by helping the server. They are required to converse back and forth with customers to resolve disputes and depending on their interests some are required to create extensive guides to help the community with certain aspects of the game. While other team leaders are responsible for holding regular staff meetings and orienting new members. Minecraft in itself can assist with learning in many ways, teachers can access these resources along with many premade lessons for most STEM content areas. Using this Minecraft game mode specifically demonstrates how players/students can develop or build upon many skills not just for school but life skills as well (Educational Benefits of Minecraft 2018). I like that you mentioned that many of our students are already playing games in their free time, so there’s a benefit to bringing this modality into the classroom. I always think of a stereotypical shy student who may not talk a lot in class but plays a lot of games at home – bringing games into the classroom all of the sudden brings them into an area where -they- can be an expert and share their enthusiasm and expertise with their peers (and even their teacher) and I’ve seen some students really blossom in that sort of situation. And the stuff you’re doing with Minecraft looks super cool! I love this whole idea. My students love minecraft so this type of server would be great to engage them in a more educational based minecraft environment. It’s so true that students are already playing games. This is a great way to get the students involved in their learning the same way they are with games. Hi Nicole! I think your Minecraft idea is a great way to meeting the needs and interests of your learners. Nothing is better than actually supplementing an activity students love doing, than incorporating it into their learning. It’s really amazing how this day and age educators and software developers are teaming up to get into the minds of our students, as I’m sure our past ancestors would be rolling over their graves witnessing just how playing Minecraft can shore up conceptual weaknesses in our students. In a modern world where the grocery store is just down the block and “Amazon” ships are everywhere, it’s always can be tough for students to relate to the continual daily struggles of a hunting and gathering society. However, students can experience first-hand the hunter-gatherer lifestyle through Minecraft in recreating the hunter-gatherer life as they hunt and gather in groups and discover that it can be easier to survive environmental threats. Also, students could even experience the benefits of agriculture by growing crops and domesticating animals instead of chasing them all over the virtual world. Relative Advantage of using Technology in the Science Classroom.